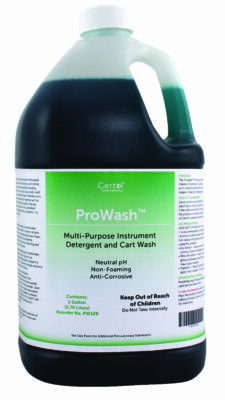 This premium, neutral pH detergent combines a powerful cleaning system with effective anti-corrosives. It’s enzyme-free formula is suitable for use on ocular instruments, and in cart washers and ultrasonic cleaning devices. ProWash detergent is non-foaming and specifically formulated for use in hard water, to ensure the best cleaning results and prevent re-deposition of soils.